The pineal gland has long been regarded as the location of the Third Eye and even has its own rods, cones and interior retina. It is thought to be a natural hyper-gate or trans-dimensional access point throughout the ages. The ‘third eye’ is considered by Indian mystics as our antenna or junction point where energy all energy comes together. 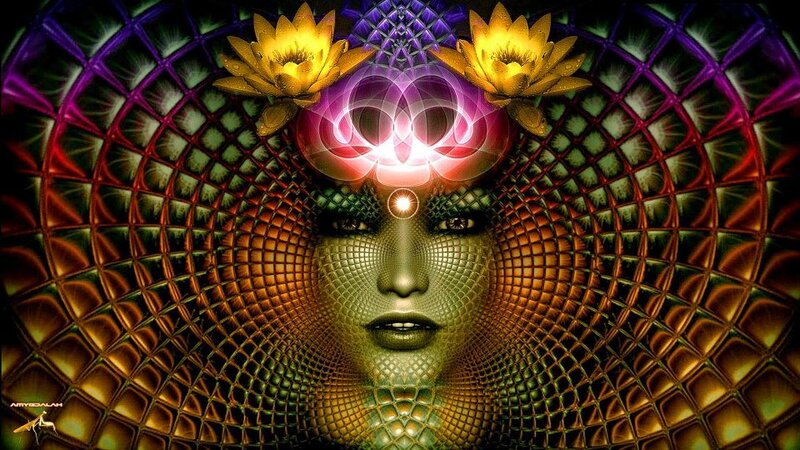 When the pineal becomes fully activated the chakras are united and have access to those higher realms are moving through your head. Just like a light globe switching on. Lack of light enhances electro magnetic activity within the pineal gland producing a buzzing, a tone or acceleration sensation within the ears like an explosive charge of energy. This can be a spiritual evolution marker, so at this time pay particular attention to what is happening around you. DMT (di-methyl tryptamine) is a key brain chemical closely related to serotonin, it acts like a neurotransmitter and is thought to have mind-enhancing properties suggesting that perhaps that we do have the ability and the utensils within to expand our awareness all of the time. The Pineal gland is a pea-sized conical endocrine gland attached to the roof of the third ventricle of the brain. Comprising of neuroglia and secretory cells called pinealocytes which excrete hormone-like substances including the endogenous amine hormone melatonin (N-acetyl-5-methoxytryptamine). Modulation of melatonin is light sensitive meaning that in darkness there is a marked increase of the production of the melatonin produced to invoke sleepiness. In any light, noradrenaline (aka norepinephrine) secretion inhibits the secretion of melatonin thus in darkness melatonin secretion is at its peak. Diminished levels of melatonin may be linked to episodes of jet lag and sleep disorders. This applies to most mammals linking them to the natural circadian rhythms of day and night and cyclical seasonality just like human beings. Our body clock is governed by melatonin and when we sleep plasma levels of this hormone are increased by ten than when we are awake. Melatonin is also a powerful antioxidant and may provide protection against free radical damage within the cells. In addition, it has been observed that the gastrointestinal tract is rich in melatonin, thus it may help to protect the stomach and pancreas and has the potential to heal chronic gastric ulcers by the stimulating microcirculation, reducing acid secretion, and improving blood flow. Excessive use of melatonin over 0.3 may result in mental impairment, severe headaches and nightmares. Fresh fruits and vegetable juices assimilate into the bloodstream rapidly delivering a vast amount of nutrients the blood in turn stimulating the pineal gland resulting in the entire body being energised due to a vibrant energetic charge from the pineal. Serotonin is the body’s good-mood neurotransmitter from which melatonin is derived is found extensively in the gut. It is secreted mostly through the gastrointestinal tract by up to 80%. It is known to modulate perception, cognition mood, emotion, sleep and appetite. Studies suggest that there is an intricate link between gut disorders, gastric problems, low self-esteem and depleted levels of serotonin. Binge eaters have been found to have low levels of serotonin making it difficult to control cravings and desire which may lead to feelings of being ravenous and uncontrollable appetite. The iconography of the pine cone can be seen from Christian perspectives all the way to the seat of Catholicism as far as the Holy Staff that the Pope himself carries. In Vatican Square, the largest statue is that of a pinecone set pride of place within the Court of the Pinecone. Pagansim also celebrates this shape. One of the common points of Pagan worship is their common symbol for eternal life, the Evergreen, both bush and tree. Further, the Pine Cone is revered because it is the “fruit” or the result of the Evergreen. Since all people of all ages wish to live forever, the Evergreen and Pine Cone have been powerful, and ancient, symbols of Eternal Life. Buddha’s head is crowned by a pine cone corning a head of pinecone like braids and in the ancient texts of Egypt the Kings can been seen with serpents protruding above the third eye chakra adorning the crown of the pine cone like head. Note King Tut’s headgear. The Hindu goddess Shiva hairdo is all “pined-up” too, complete with serpent she breaks down the old to purify the pathway of the new paradigm. Pine trees lining streets as a welcome to town may well be interpreted as a gateway to a sacred site such as beautiful Byron Bay, Australia. French philosopher Rene Descartes’ (1596- 1650), the “Father of Philosophy” considered the Pineal gland to be of paramount importance as the connect point between the intellect and the body and thought it to be the Seat of the Soul. To make the pesto, place the basil, olive oil, garlic, lemon juice, and salt in a food processor. Process until the basil is chopped. Add the pine nuts and process until smooth. Pesto will keep for five days. Crumble over a raw pasta dish or salad to satisfy any parmesan craving. Place the water, pine nuts, and salt in a Vita-Mix or blender and process until smooth. Add the probiotic powder and blend briefly to mix. Spread the pine nut mixture thinly onto Teflex-lined dehydrator trays. Set the dehydrator to 105 degrees F and dehydrate until completely dry, about 24 hours. Crush the Pine Nut Parmesan by hand and store in a tightly covered container in the refrigerator.